Science is a funny thing: sometimes it’s too difficult or too expensive to get to study the real thing – so you study analogues instead (things you think resemble the real thing) and see if you can draw reasonable conclusions about the real thing from that. Analogue modeling is great fun, and it does stimulate the thought processes, but you must never lose track of the fact that there’s a huge difference between reproducing the same end-result and simulating the natural processes to get there. Technically, this is known as the problem of causality; just because you turned A into B, doesn’t guarantee that you did it the way that nature did. Here’s a typical image of one kind of Martian topography: canyons ! Most planetary geologists would suggest that they were carved by water. Here’s another image of the same phenomenon, and it highlights part of the problem with this hypothesis: both the main canyon and its lateral alcoves are “blind” – they simply stop at steep cliffs. This raises a critical question : if they were carved by water, where did that water come from ? On Earth, your average valley is carved by river systems that have a typical branching pattern as tributary valleys coalesce progressively to feed into the main valley – but not here. The previous images showed you the “upstream” end of typical martian canyons; this is the “downstream” end, looking back upstream. This is where whatever was eroded to form the canyon has spilled out of the canyon mouth to form what’s technically referred to as an “outwash plain”. This is a very ordinary sandy beach in Brittany, Western France, where I spent much the Spring of 2012. It’s nothing special, as beaches go - at least by Breton standards. Notice how flat it is here : not much of a slope. Also, notice how wet it is, 10’s of metres from the sea. This is going to turn out to be very important in my martian analogue proposal. Here I’m standing close to the surf zone, looking inland toward sand dunes that form relatively high ground compared to the beach. Note the dry sand between the dunes and the more extensive wet sand. What does this tell us? It tells us that the sand beneath the surface is waterlogged, and that the upper limit of the waterlogged sand intersects the surface slope of the beach a long way inland from the sea. 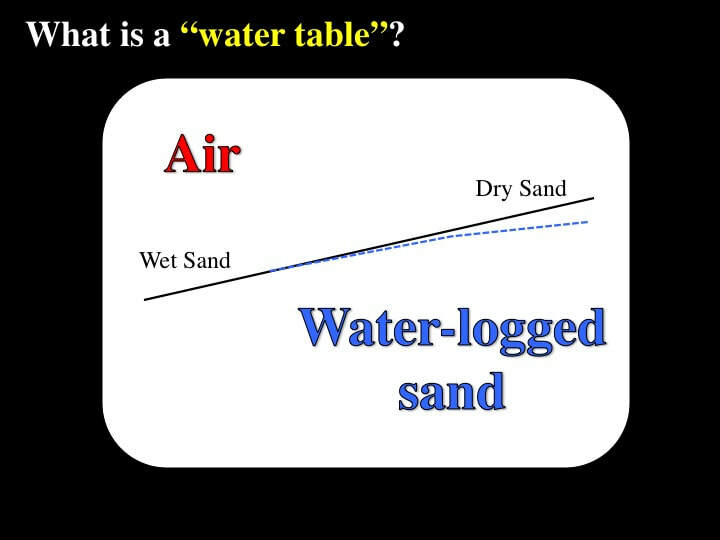 This upper limit of the water-logged sand is called the “water table”. Note the streakiness of the wet sand. If we walk inland toward the dry sand, but still within the wet sand here, we can see that the streakiness of the wet sand has an inland limit – above which the sand is perfectly featureless. Here we’re within within about a metre of where the water table comes to the surface of the beach, and where surface water starts to flow down the very shallow slope of the beach with just enough energy to start to erode very shallow channels in the sand. It may just be a coincidence, but here on the left is a very similar channel pattern on the martian surface that appears to start from nowhere - just like the beach features. Note that the martian pattern is at the scale of kilometres to tens of kilometres, in contrast to the beach channels. Back to the beach. Unlike rivers and streams, these channels are everywhere. Instead of the water localizing in narrow valleys, it flows like a huge sheet, uniformly about a few millimetres deep. While the water doesn’t concentrate in valleys, some of these anastomosing channels are longer and more continuous than others. So what, why get excited ? This is why … On the left is a martian landscape, kilometres across, with an analogous pattern of channels to those in the beach sand. If we look more closely at the beach sand, we see that the surface water has carved anastomosing channels that isolate elliptical islands with older, even finer scale channels still preserved internally. If we get closer still we can see that the surface water in the anastomosing channels has even carved cliffs that stand several millimetres high. If the width of these channels was really kilometres, these vertical cliffs would be the equivalent of 10’s to 100’s of metres in height. Still at the beach, as the erosion in the channels proceeds, it progressively isolates elliptical islands of high-standing sand. Here on the left is a martian example of something that looks very similar to the beach channels: I suggest that the two are analogous. Here’s a second example of what I suggest is the same analogy. How do we know that these channels and islands are really erosional ? On the beach we can see the relics of older beach ripples that can be traced from one sand island to the next. The ripples have clearly been truncated as the shape of the islands was determined by erosion by flowing surface water that was still flowing in the channels as I took these photos. Here on the left is a martian analogue with internal ridges that can be traced from one topographic island to the next. Remember, in all cases here, the martian examples are very different in scale from the beach pictures. Let’s go back to just downslope from where the water table intersects the beach surface and erosional features first begin to form. Apart from the dog paw-prints - definitely not martian analogues - what do we see ? I see a trough with a blind upper-end that appears to be the source of a very different kind of sand from that at the surface, sand that forms what looks like a down-stream outwash plain, and had to be derived from underground. This was not a random, one-off feature. These blind troughs appear to be characteristic of the beach close to the point where the erosional features first appear. Here you can start to see how they are indeed blind and are bounded by lateral cliffs. These are what geomorphologists (physical geographers) refer to as box canyons - and in this particular case you can clearly see that the canyon floor has a few millimetres of water flowing in it, while the plateau into which the canyon is carved is dry. Clearly the water in the canyon is coming out of the ground. It is groundwater, and it reflects the level of the water table at the moment I took the photograph. Here you can clearly see how the flow of the groundwater onto the canyon floor at the base of the canyon cliffs is leading to the collapse of the canyon walls. This is not erosion by surface water : this is what geomorphologists refer to as “sapping”, as the groundwater oozes out of the ground. Here, at a very different scale, is a potential martian analogue of the beach box canyons, probably several 10’s of kilometres across, at the very least. As for the beach examples, the canyon is blind and there are no tributaries that would have fed surface water into the canyon to account for the erosional topography. … and yet another, just to press home the point that these blind canyons are very common on the martian surface. Back to the beach, where I came across this beautiful example of multiple blind box canyons that represent tributaries to a major channel. I suggest that this is an analogous feature at the scale of multiple kilometres on Mars. These blind canyons on the beach look like the larger examples on Mars, but what does that tell us about whether the processes that formed them were similar ? Here, back at the beach - plus paw-prints and foot-prints - you can see a blind box canyon feeding into an outwash plain, and at the mouth of the canyon you see what appear to be blocks of canyon wall that have slumped onto the outwash plain. … that look very similar to analogous features on Mars. On the beach, you clearly see that the cliffs at the head of the box canyon are eroding back into the undisturbed sand by sapping and slumping. Similar slumping is the primary mechanism for forming the steep cliffs that bound the large curvilinear channels too. In fact this one just happened to occur as I was passing, so I actually witnessed the process first-hand. Here, on the left, is what I would suggest is a direct analogue of erosional cliff formation by slumping in a large curvilinear channel on Mars. Here is yet another example – again to make the point that this is not an isolated phenomenon on the red planet. Back to the beach once more … As already mentioned, the blind box canyons commonly feed into outwash plains – and where several canyons are closely spaced, those outwash plains can be quite extensive, even impressive. Here’s what we were looking at in the last slide, but looking upstream towards the box canyons. Note the now broad curvilinear channels filled with shallow water separating the large elliptical islands with steeply eroded cliffs, and the streakiness in the channel floors. I suggest that the previous beach example is an analogue for this martian case where broad, curvilinear channels spill out of the heavily cratered Highlands onto the relatively smooth Northern Plains. (NB: this web image appears to have been heavily doctored to give the impression of surface water). … and again here ! They may not be identical in every way, but I think you get the point : the processes we see on the beach make us think about how similar features may have formed on Mars. Referring back to slide #4, how do you think it compares with the image of what I would suggest is an analogous location with respect to box canyons on the beach ? Here’s a last look at the beach, looking toward the sea and the surf zone. The take-home message from this photo is that the outwash plains with their flowing water and the active erosion of the cliffs at the upstream ends of the box canyons on the beach have nothing to do with wave and surf activity of the ocean itself. Everything we’ve looked at here is related to the release of groundwater and its arrival at the surface, the surface of the beach, and - I would suggest – the surface of Mars. Analogue modelling is very exciting. However, we must not get carried away. Analogies between models and reality do not automatically mean that the models accurately simulate the natural processes that led to what we see - for example - on the surface of Mars today. Philosophically, this is the problem of “causality”: there are lots of possible ways of getting to an end-result, but which one represents reality ? Just because I can show you analogues of Mars on a beach does not mean that I have proven anything. Let’s look briefly at just two flaws my analogy. First, if you look at real martian canyons from far enough away, they look very smooth, as in this image. ​However, if you look inside them at high resolution, there’s a roughness that the beach models simply do not reproduce. Hence, even if you accept that the general geometry and relative dimensions of the beach and martian box canyons are similar, there is a major scaling error in the analogies that I have drawn for you here. Second, if you scale the canyons, channels and cliffs on the beach up to the scale of the real features on Mars, our beach sand grains should represent boulders the size of houses, or larger This is clearly not what we observe on Mars, so - if for this reason alone - you should beware of taking my proposed analogy too literally. However, the beauty and the purpose of analogue modeling is that it enables us to envisage possibilities that may not otherwise have occurred to us – and to push our critical evaluation of those ideas that much further forward.